Go over current and predicted tuition and fees for Bergin University of Canine Studies, and how these charges compare to the U.S. average. Get a good understanding of the tuition charges associated with Bergin University of Canine Studies in order to plan effectively for 4-6 years. Check out the stats below to know how Bergin University of Canine Studies' cost measures up to other schools and if you should plan for tuition increases. The following table outlines how Bergin University of Canine Studies measures up to other schools nationally, regionally and by state. How Much Will Tuition & Fees Be for Bergin University of Canine Studies? In the 2017 - 2018 school year, regular undergrads at Bergin University of Canine Studies were billed $9,975, prior to adjustments for financial need. Of this amount, the expense of tuition totaled $9,375. $600 was fees. Regrettably, this school does not offer any special discounts to students who live in state. Bergin University of Canine Studies tuition and fees is the sum quoted to students for one academic year, and doesn't include room and board. Having said that, a lot of students wind up spending less than full tuition after receiving financial aid and other discounts. For more information, check out Bergin University of Canine Studies Part Time Tuition & Fees. 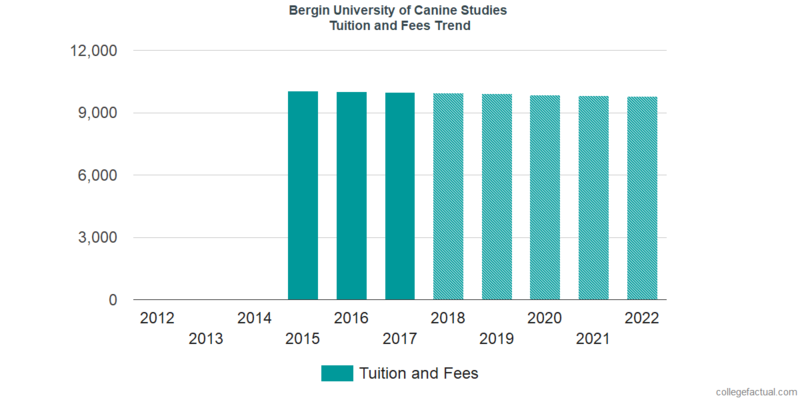 Bergin University of Canine Studies tuition and fees have not changed significantly over the last five years. We anticipate the expense of tuition and fees for this year will total $9,938. If costs continue to remain stable, two years at this school will run you $19,839 and four years will run you $39,532. Furthermore, you will probably have extra costs for room and board, transportation, and books. The following chart shows projected future tuition and fees for undergraduates at Bergin University of Canine Studies. Pay attention to how much college fees and tuition is increasing every year. At a lot of schools undergrads will end up spending more money on their final year of college than they did for their first.